Canada's largest pipeline company is getting bigger through mergers and acquisitions. Enbridge has gone on buying spree after facing opposition to its pipeline expansion plans. It has been difficult for Enbridge to move ahead with its pipeline projects so the company has decided that if it cannot build pipelines it will buy them. Enbridge has prospered because of petroleum they have also contributed to the climate crisis. Things have not been going so well for Enbridge. They have had to endure low oil prices and they have been deluged with a number of protests. Recently Enbridge's security forces attacked protestors with dogs and pepper spray near Standing Rock Sioux reservation. On September 6th an affiliate of Enbridge Energy Partners (EPP) withdrew regulatory applications associated with the Sandpiper pipeline project citing low crude oil production in North Dakota. Earlier this year a Canadian appeals court overturned federal approval for Enbridge’s $7.9 billion Northern Gateway pipeline that would have transported crude oil from Alberta to British Columbia. The B.C. Supreme Court ruled the provincial government failed on two counts: 1. They did not adequately consult with First Nations people along the Enbridge Northern Gateway pipeline. 2. They did not conduct an adequate environmental assessment. 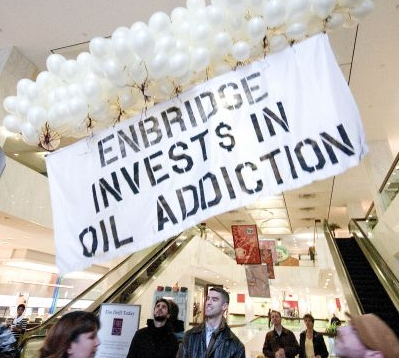 Enbridge is involved with a number of lawsuits either as the defendant or the plaintiff. The company has also been responsible for multiple spills including a 2010 Kalamazoo River oil spill which resulted in a class-action lawsuit. In total the company is responsible for almost 1000 spills. In August Enbridge and U.S. refiner Marathon Petroleum Corp. bought a 49 per cent stake in two pipelines, the Dakota Access Pipeline and the Energy Transfer Crude Oil Pipeline, to provide a new route from North Dakota to refineries in Louisiana and Texas. The $2.6-billion Enbridge deal means that more Canadian oil will make its way to the US Gulf Coast. As reported by the Financial Post, in September the partner behind Nexus Pipeline was acquired by Enbridge, in addition to the pipeline Enbridge diversifies into gas gets access to huge new markets as part of $37 billion deal. Enbridge has merged with Houston based Spectra Energy Corp. to create a new integrated pipeline “colossus” with a massive $48 billion worth of potential future projects. This makes Enbridge the largest pipeline company by market value on the continent. The combined company, which would retain the Enbridge name, would have $26 billion worth of projects currently underway and $48 billion worth of projects planned following 2019. What should be clear is that Enbridge's pipeline expansion plans are at odds with combating climate change. Enbridge has also abandoned carbon capture.